Yay! I finished my first all-out action scene, and finally uploaded it. However, I think there are a few awkward places, perspectives and sizes that could have been done much better, but I think it's quite alright considering my level of expertise with digital painting. 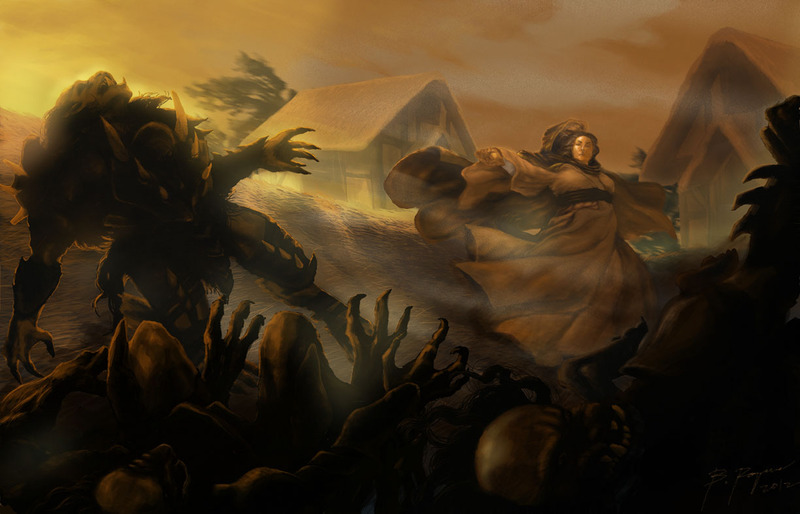 Here you can see Kiruna Nachiman (left) and Bera Harkin (right), surrounded by three (out of their seven) warders, fighting off the Shaido Aiel, in a scene from the Wheel of Time, Lord of Chaos. I don't think there's a line where they're fighting side by side, as it was a busy Perrin who saw them dropping themselves one by one in the middle of the battlefield, so that they could channel effectively. Kiruna Nachiman was said to be queenly, statuesque, and had a commanding presence. Bera Harkin on the other hand, was plain, square-faced and looked like a farmwife who became prosperous. 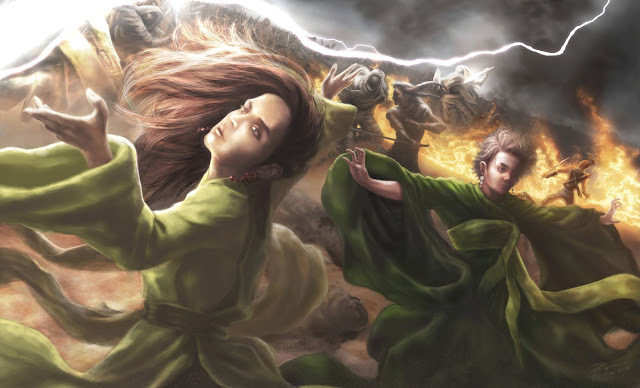 I painted them in somewhat Asian-inspired clothing, as these are quite wonderfully maneuverable even if they are made of silk or any other soft fabric, which I thought was perfect for Aes Sedai. 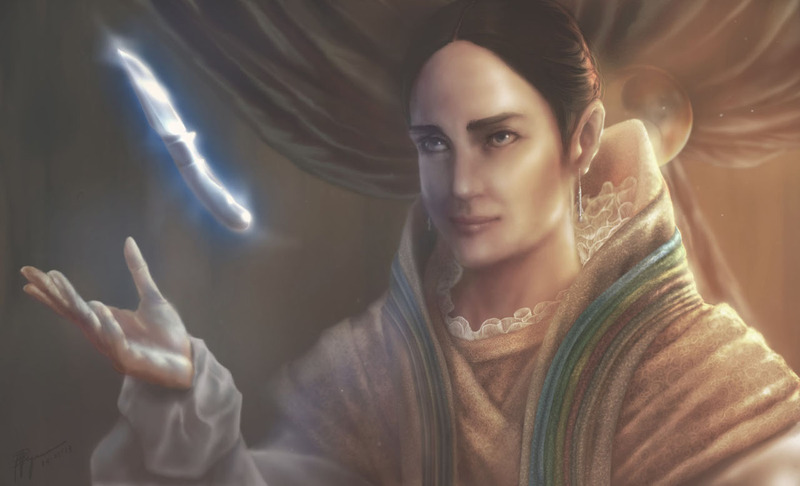 I'm also somewhat getting a little addicted to putting 'nationality earrings' on these Aes Sedai as evident in Siuan Sanche's silverpike earrings..
Kiruna has rose earrings - something of Arafel her homeland, where she was the king's sister. While plain Bera has silver lion heads - a reminder of the white lion of Andor where she came from. I think Bera's short hair and plain face coupled with the opulence of her earrings is a great contrast. Also, I first wanted to portray Kiruna with tied-up hair and having a long neck, to get that Ms.Universe feel, but I settled for windswept hair for a little dynamism. As usual, agelessness is quite hard to perfect, more so with tricky lighting. I think I've managed to paint 'something off' about their faces, so I think it's ok. And I had to remember that they were calm and serene, even during battle.